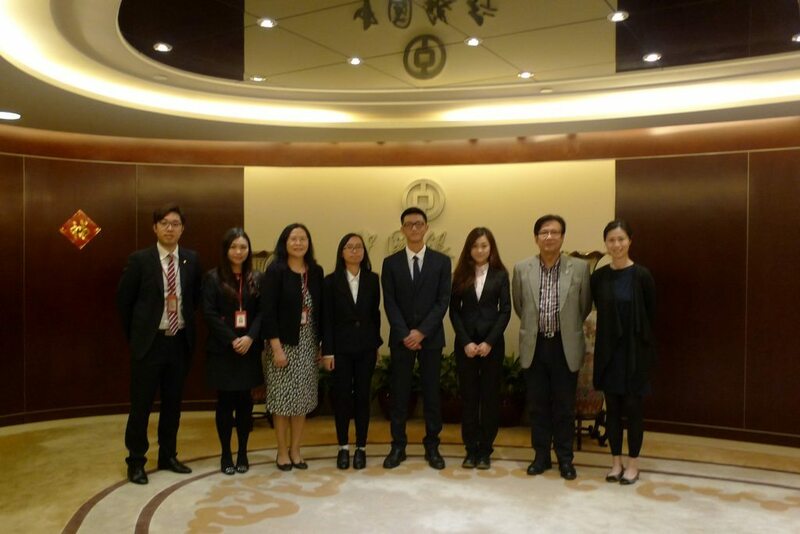 In order to maintain a good relationship with our donors and increase the understanding between the donor and their respective scholarship recipients, Alumni and Development Office (ADO) along with the recipients of the “Bank of China Grand Lotus Scholarship” have recently visited the Bank of China Macau Branch (BOC). Mr. Peng Chun Vong, Director of Alumni and Development Office, together with three recipients of the “Bank of China Grand Lotus Scholarship 2016/2017” visited the Bank of China Macau Branch. The participants were welcomed by Ms. Chen Fen, Director of the Personal Banking Department of BOC. The visit commenced with a brief self-introduction from each student, followed by a sharing and discussion session about career planning and community development. Ms. Chen was impressed about the performance from the students and encouraged the students to make good use of and enjoy their university life experience so as to get prepared to join the workforce in the society. During the visit, three scholarship recipients took the opportunity to present a thank you card to BOC as an appreciation to their generous support. A tour about the bank’s history and development of the Macau financial industry was arranged to the participants afterwards. UM Grand Lotus Scholarship is the top award among all admission scholarships, aiming to encourage local students with excellent academic record, comprehensive all-round achievements and contributions to Macau. In academic year 2016/2017, four year one students were awarded with Bank of China Grand Lotus Scholarship. Three recipients attended the donor visit this time while the fourth recipient was participating an exchange program oversea.